Amr A. Moubasher, Undine Lippert, Christos C. Zouboulis. In the following case report we describe a 66 year-old man who was presented with a squamous cell carcinoma (epithelial tumour) on the skull which grew on the scar of a previously surgically excised sarcoma (mesenchymal tumour). This is the first description of such a coincidence, which may be due to the development of a mutated stem cell colony, which differentiated in tumour cells of several lineages. 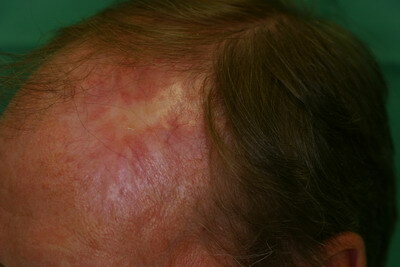 The 66 year-old patient presented to our Departments with a 3-month history of a 0.5 x 1 cm large, erythematous, ulcerated skin lesion over the medial side of a surgical scar on the left parietal side of the scalp (as shown in figure 1a). The scar (as shown in figure 1b) was due to surgical excision of a sarcoma (G2) 5 years ago . At that time the dermatological examination of the patient had detected a painless solitary 3 x 5 cm large, erythematous swelling (as shown in figure 2a) and the histopathological examination (as shown in figure 2b) had detected pleomorphic mesenchymal cellular regeneration in the subcutaneous tissue with a limited nodular process. A focal fibrotic false capsule had been seen. 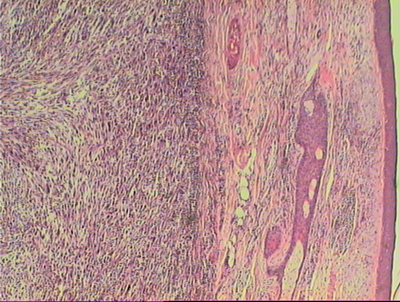 The tissue had shown myxoid infiltration. An immune histochemical staining had revealed negative results for CD34, S100, actin, desmin and pancytokeratin staining, while labeling with the Ki67 antigen had detected a proliferation rate of 80%. The skull computer tomography prior to surgical excision of the tumour has shown a localized space-occupying lesion in the soft tissue without intracranial metastasis. The chest computer tomography did not reveal any pathological signs. 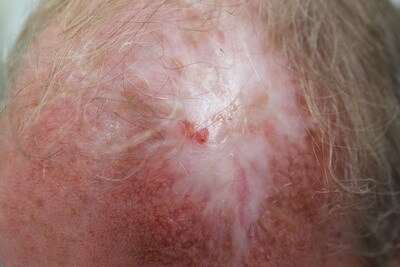 Fig 1a: A 0.5 x 1 cm large, erythematous, ulcerated skin lesion over the medial side of a surgical scar on the left parietal side of the scalp before surgical excision. Fig 1b: Histology: Squamous cell carcinoma with a total depth of 0.7 mm. Orthohyperkeratosis, epidermal hyperplasia with disturbance in the cell arrangement of the lower epidermal layers associated with cellular and nuclear polymorphism. Proliferation of atypical epithelial growth in the upper dermis was seen (hematoxylin and eosin). 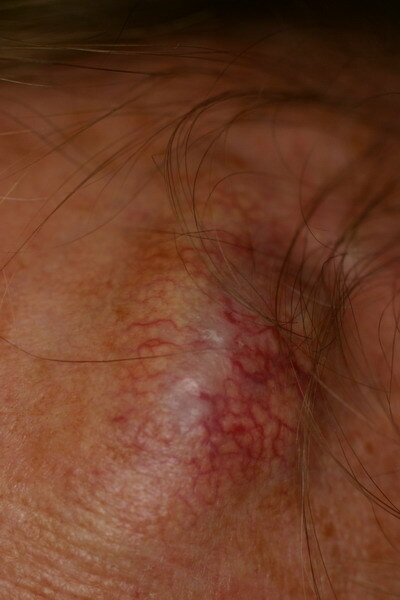 Fig 2a: A painless solitary 3 x 5 cm large, erythematous tumour with teleagiectasia over the left parietal side of the scalp. B) Sarcoma: pleomorphic mesenchymal cellular regeneration in the subcutaneous tissue with a limited nodular process (hematoxylin and eosin). Fig 2b: A focal fibrotic false capsule can been seen. Fig 2c: The left parietal side of the scalp after surgical excision. The regular oncological follow-up of the patient every 6 months has detected two basal cell carcinomas over the left side of the back and the right lower limb after 2 years, which were treated surgically with elliptical excisions. The current lesion on the skull was also detected at the regular follow-up and was surgically excised. The histological examination showed orthohyperkeratosis, epidermal hyperplasia with disturbance in the cell arrangement of the lower epidermal layers associated with cellular and nuclear polymorphism. In addition, proliferation of atypical epithelial growth in the upper dermis was seen (as shown in figure 1a). The diagnosis of squamous cell carcinoma was concluded with a total depth of 0.7 mm. There was no evidence of sarcoma recurrence. The regional lymph nodes and the chest were free of lesions in imaging examinations. Soft tissue sarcomas account for 1% of all malignancies. Approximately 60% of soft-tissue sarcomas arise in the extremities. The lower extremities are three times more often involved than the upper extremities. Further sites involved are the trunk (19%), the retroperitoneum (15%), and the head and neck (9%) . Approximately 80% of head and neck sarcomas occur in adults, whereas the most common subtypes are osteosarcoma, angiosarcoma, malignant fibrous histiocytoma, and fibrosarcoma, and 10-20% occur in children, the most common subtype being rhabdomyosarcoma . On the other hand, squamous cell carcinoma is the second most common malignancy of the skin after basal cell carcinoma and the skin is the most common site for squamous cell carcinoma . It accounts for 20% of cutaneous malignancies and 80-90% of all head and neck cancers . Sun exposure is a major risk factor for epithelial tumours, while sarcoma growth does not seem to be related to sun exposure. 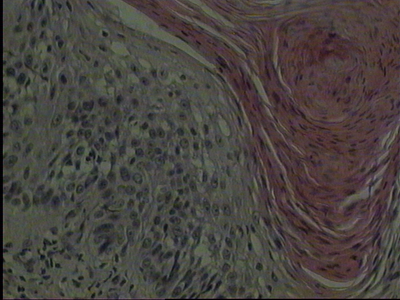 In our patient, skin tumours of different lineage, namely squamous cell carcinoma of epithelial (ectodermal) and sarcoma of mesenchymal (endodermal) origin, occurred at the same skin region in a period of 5 years the former developed over the scar of the latter: Such a coincidence has not been reported before. Since these lesions were the only tumors detected in this patient, a mutated stem cell colony, which is able to differentiate in cells of several lineages, could be speculated . 1. WHO classification of soft tissue tumours. 2006; 10-17. 2. Potter BO and Sturgis EM. Sarcoma of head and neck. Surg Oncol Clin N Am 12:379-417, 2003. 3. Sidappa KT and Krishnamurthy A. Adult soft-tissue sarcomas of the head and neck. Indian J Dermatol 48:284-288, 2011. 4. Papadopoulos O, Frantzoglou M, Chrisostomidis C, Konofaos P, Frangoulis M and Barlas G. Neglected squamous cell carcinoma of the frontal area: a clinical report. J Craniofac Surgery 17:1015-1020, 2006. 5. Hiu CS, Lin CY, Kuo TT, Kuan YZ, Chen MJ, Ho HC, Yang LC, Chen CH, Shih IH, Hong HS and Chuang YH. Malignant cutaneous tumors of the scalp: a study of demographic characteristics and histologic distributions of 398 Taiwanese patients. J Am Acad Dermatol 56:448-452, 2007. 6. Zouboulis CC, Adjaye J, Akamatsu H, Moe-Behrens G and Niemann K. Human skin stem cells and the ageing process. Exp Gerontol 43:986-997, 2008.